Later Jim Created artwork for Alice Cooper, Prince, Authors Clive Barker, Robin Cook and many others. Jim now focuses on his fine art paintings including his whimsical portraits of people and pets, as well as collaboration paintings with artists Wyland, Michael Godard and with Disney Studios creating a whole new style of art. During the 80’s Jim pursued his high school dream of painting album cover art and painted hundreds of magazine illustrations, movie posters, book covers and especially album covers for such stars as Alice Cooper, Prince and Bob Seger, the latter winning A Grammy Award for best album package for the cover of Seger’s “Against the Wind” album which reached #1 on the Billboard 200. The 90′s ushered in a new focus, that of the environment and saving earth. 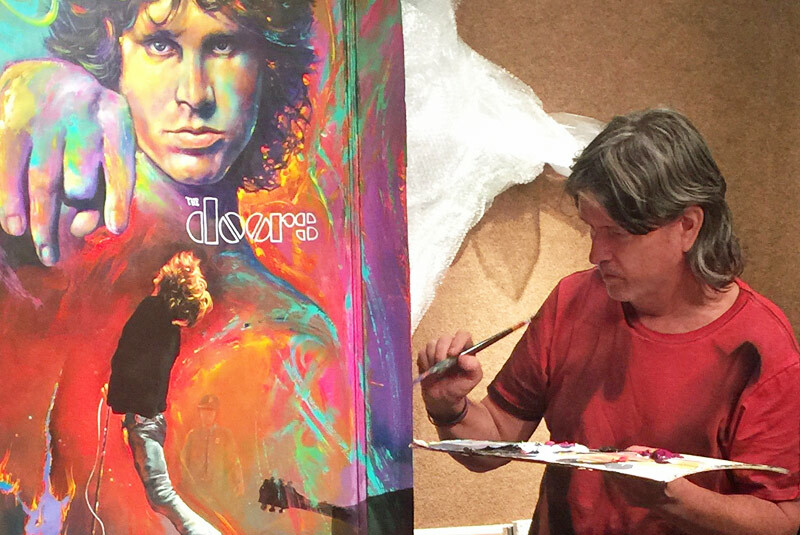 Jim painted “Earth…Love it or Lose it” which received critical acclaim and was featured on numerous magazines, billboards and shirts. It also became a popular visual representation for the global environmental movement. In the mid 90′s Jim began painting famous actors and incorporating celebrities and friends into his work referring to the works as “personalized paintings”. Jim painted Juliette Lewis, Wyland and Michael Parnell (CEO of Oakley Sunglasses) during this period. In 2004, Jim’s collaborations with Disney were released as fine art prints. Jim continues to paint Disney characters and his own unique interpretations of Disney characters to this day.In 2009 Jim began painting celebrities for the Fame-Wall project in New York and Hollywood (www.fame-wall.com), painting portraits and unveiling them with the likes of The Beach Boys, John Stamos, Kelsey Grammar, Kristen Chenowith, Brooke Shields and others. In present day Jim continues to expand on his work and create new worlds on canvas. When not in his studio Jim enjoys time with his wonderful family. Jim considers his greatest accomplishment to date to be the many letters and communications he has received from around the world from his fans sharing how his work has inspired them and made their days a little brighter. If you would like to send a letter to Jim, please visit the Contact page and send an email. In 2010, a two-part interview was conducted at Jim Warren Studios where Jim talked about his life as an artist. In this exclusive interview, he touches on his inspiration, offers advice and provides insight to his incredible career spanning over four decades.